Does a high FSH level signal the onset of menopause? It was an FSH level of 42, at age 42, that according to fertility specialists placed me among the irreversibly infertile. Which is why I’ve engaged with the subject of FSH levels such as: The link between high FSH levels and menopause, so called Premature Ovarian Failure, the likelihood of pregnancy in spite of rising FSH, and every related question—more than any other fertility linked diagnosis. Having heard thousands of women in my workshops and private practice report mixed messages about high FSH from their fertility specialists and surprisingly also from their fertility acupuncture sessions, the subject begs for a deeper discussion. 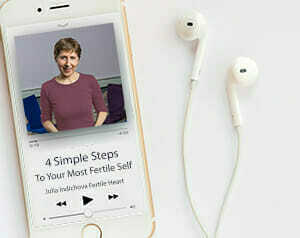 Here is what I have learned as a result of direct observation in the laboratory of my own body, and from reports and observations of countless women who, with the help of the Fertile Heart™ Ovum tools have turned their high FSH crisis into a journey of self discovery. For many of them it became an opportunity to strengthen their bodies and hearts and quite possibly give birth to healthier children than they would have without the sobering diagnosis. High FSH can be the most desirable diagnosis if you use it to realize that your body is an exquisite mix of flesh, feeling, history and mystery; if you allow for the possibility that your body is choosing this particular way of asking for attention for a reason. A reason you may not fully understand but a reason that will unfold as you learn to open your eyes to the guidance all around and within you. If you start tinkering with estrogen patches and even tinker with potent Chinese herbs that are intended to forcefully lower your elevated FSH (which often results in high estradial numbers masking the FSH issue), you may not only waste precious baby making time, but often do harm to the perfectly viable remaining ovarian reserve. Yes, a high FSH might very well signal a lesser supply of follicles. That doesn’t mean you don’t have one or two or more fabulously gorgeous eggs left to make fabulously gorgeous babies. But your goal is not to lower FSH levels. Your goal is to have a healthy full term pregnancy and a healthy child. The only time your goal is to lower FSH is if you want to fool your endocrinologist and sneak into an IVF program in spite of your rising levels. Or your doctor is choosing to do you a ‘great favor’ and ‘push’ for performance when your body is screaming for help. Sadly, I have seen couple after couple get lured into years of experimentation by the so called FSH friendly doctors. “I’ll keep going until you tell me to stop,” said one of these cavalier fertility specialists to a client after 11 cycles of Clomid and estrogen patches. Similarly I see them shell out thousands of dollars for twice weekly acupuncture sessions terrified to miss an appointment. Certainly a thorough diagnostic intake that measures your hormone levels, and offers the requisite diagnostic procedures can be useful. And Fertile Heart has a long list of wonderful practitioners of Chinese Medicine. Many of my clients have found fertility acupuncture to be a useful healing modality. But what you do with the information you receive from your doctors and healers, the degree to which you yourself learn to understand the root of your symptoms, can make all the difference in your baby making adventure. Jacqueline’s story is one of many beautiful case histories of women who used the Fertile Heart™ tools to became experts on their high FSH diagnosis.